PBA officials led by Commissioner Chito Salud, special assistant Willie Marcial and operations chief Rickie Santos do a final ocular inspection of the Philippine Arena. The PBA is set to become the first to stage a sports event at the newly opened Philippine Arena inside the vast Ciudad de Victoria compound owned by religious group Iglesia ni Cristo in Bocaue, Bulacan. 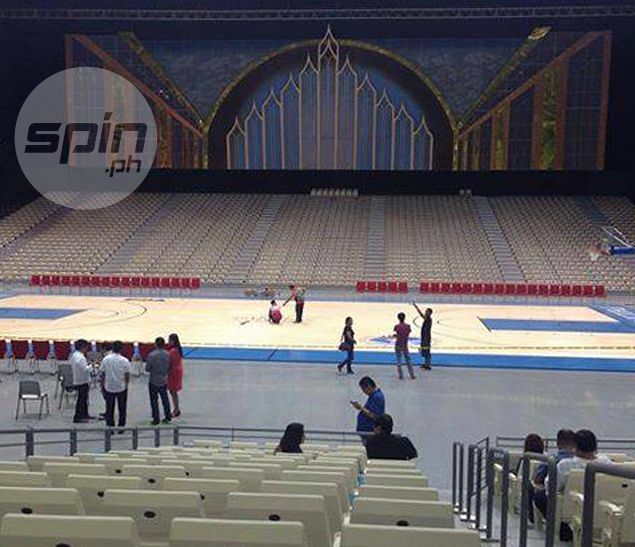 After a second ocular inspection by the league, PBA commissioner Chito Salud has given the seal of approval for the staging of the ceremonies and games kicking off the league's 40th season on October 19 in what is reputedly the world's biggest domed arena. “Nasilip na namin. OK yung facilities nila. Pasok sa PBA standard yung court, yung flooring pati yung mga lockers nila. Even the acoustic for our sound system is A-OK,” PBA media bureau chief Willie Marcial told Spin.ph while on their way back to Manila after the visit. “We are so happy that our officials from the Philippine Arena and Iglesia ni Cristo have been very accommodating to us,” he added. Marcial said both parties have agreed in principle and only contracts are left to be signed for the staging of PBA games at the facility, which has a capacity of 55,000. “OK na lahat. Tuloy na yun. Magpipirmahan na lang kami ng kontrata,” said the amiable league official. “Pero tuloy na… wala nang kanselasyon. We liked what we saw,” added Marcial, who hopes to attract the biggest PBA crowd of atleast 52,000 to the newly opened arena which is almost thrice the capacity of six-decade old Smart Araneta Coliseum. “Happy tayo kasi ang PBA ng unang pinahintulutan ng mga kapatid natin sa Iglesia na gumamit ng kanilang world-class facility,” said Marcial. Joining Salud and Marcial in the ocular inspection were PBA chairman Patrick Gregorios’ staffer Annete Ocampo, league operations head Rickie Santos and a other league officials.